There are a lot of options to consider when looking for the best pocket knife for whittling. While it’s true that almost any pocket knife will allow you to do some carving, there are a number of pocket knives for whittling that offer specialized tools just for carving as well as some pocket knives that are designed to be useful for carving while still providing the versatility to act as your everyday knife. We’ve gathered the best of the best, in a range of price options and functionality, to help you choose the right whittling pocket knife for you. Our favorite is the Carvin’ Jack by Flexcut which is like having all of your carving tools in one handy tool. 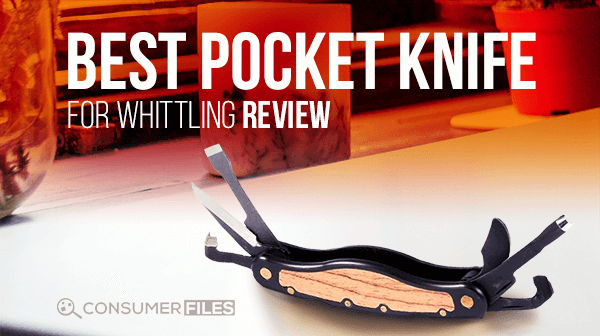 This whittler pocket knife combines the convenience and portability of a folding pocket knife with the efficacy and practicality of having multiple specialized tools. The Carvin’ Jack has six different carving tools that all fold neatly into a 4 ¼ inches long handle. Each of the tools is made of stainless steel and is spring-locked to keep the tool safely locked in place while in use. This also keeps each tool securely folded in so you won’t have to worry about accidentally catching your finger on the v gouge, for example, when retrieving this knife from your pocket. The included tools are a detail knife, straight gouge, V-scorp, gouge scorp, chisel, and hook knife. This means that you’ll have the right tool regardless of where you are, making this a great choice if you like to whittle on the go. These tools all come pretty sharp, too, and they hold an edge. While you can sharpen these tools yourself or pay Flexcut to do so, regular stropping after a few hours of use will keep this pocket knife for whittling sharp and ready for your next project. This whittling pocket knife includes a leather sheath with belt loop, compound, and leather strop﻿. It weighs 3 ½ ounces. Check out the Carvin' Jack Whittler Pocket Knife... Click here. This Carver’s Congress style pocket knife is designed to provide you with a variety of tools for an effective all-in-one whittling tool. It features four different blades made of 1095 carbon steel. While this is a pretty common steel type for pocket knives, it was specifically chosen for this whittling pocket knife due to its impressive ability to withstand the pressure and twisting that whittling tools undergo. This type of steel does have a lower resistance to ﻿corrosion﻿, however, in addition to being tough, it is able to take an extremely sharp edge. Back springs with just the right amount of pull make it easy to unfold any of the blades and eliminate worry of the blade folding in on you while working. It features a sheepsfoot blade which is ideal for slicing and cutting as it does not have a point, a pen knife which is great for digging and gouging, a round tipped spey blade that can be used for scooping, and a coping blade which is useful for shaving. This knife measures 3 ¾ inches long when closed. As it is a congress style pocket knife, the handle has a slight curve to it, making it concave toward your palm when gripped. This may seem like it should be a bit awkward to use a congress pocket knife for whittling, but the curve is rather ergonomic. That curve also makes the knife more durable as it is better able to disperse the force when bearing down while carving. Find reviews of the Carver's Congress Knife... Click here. This is another Imperial Congress style pocket knife for whittling that offers a more affordable option than the Boker while providing the same versatility. It features four blades made of Martensitic stainless steel. This type of stainless steel strikes a great balance among the most ideal traits of a knife steel. It has great resistance to corrosion, holds a sharp edge, and is relatively easy to sharpen. While it is one of the best pocket knives for whittling, this congress knife makes a great general use pocket knife that’ll easily handle everyday tasks. This whittler pocket knife has two sheepsfoot blades which are great for general carving and removing larger sections of wood, a coping blade which is great for shaving, and a pen knife which is great for finer detail work. The handle has celluloid scales in an amber color, with stainless steel bolsters on both ends. Closed, it measures 3 3/5 inches long and weighs 2 ½ ounces. 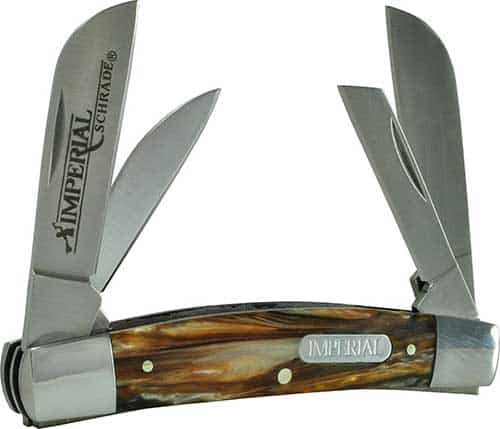 More info on the Imperial Congress Pocket Knife... Click here. This is one of the most unique whittling pocket knives we’ve seen. It has an impressive design that really catches the eye yet is highly functional as a detail tool for whittling. 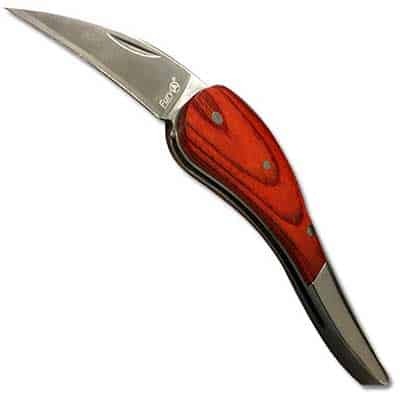 Plus, this is one of the best whittling pocket knives for the money, with a great price that makes this unique knife perfect as a first knife for that young whittler in your life. The Nobility Raindrop﻿﻿ features a single blade with a clean cutting edge and steeply slanting spine that provides a good point on the end. This makes this blade rather versatile as it shaves cleanly much like a chisel would, yet has that finer point needed for detail work. 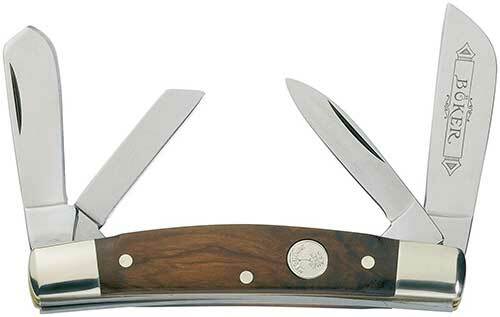 The blade is made of 440 stainless steel, a common blade steel as it is tough and holds a good edge. The blade measures 2 inches in length, while the handle measures 3 ½ inches in length. The handle is also uniquely shaped, as it is more tear drop shaped, narrowing and trailing off at the end. While it is an unusual shape, it provides a solid hand feel that makes it comfortable to use. 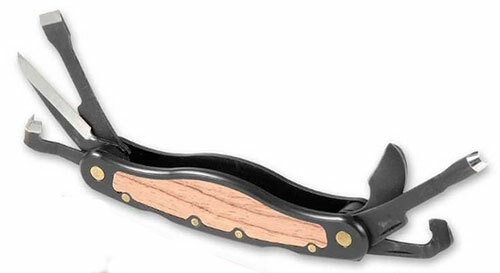 The handle is made of rose colored pakka wood, a stabilized wood that is able to withstand humidity and wet conditions. This makes this one of the best pocket knives for whittling as it is durable. The only downside of this whittling pocket knife is that it doesn’t have a locking mechanism. While this isn’t that big of a deal while using it, it can cause the blade to open slightly while in your pocket -providing you with a sharp reminder when you reach into your pocket. Get deals on the Nobility Raindrop... Click here. Pocket knives for whittling come in a variety of designs, each with their own advantages and disadvantages. When it comes to choosing a tool with less versatility but more functionality specifically for wood carving, our pick for the best pocket knife for whittling could only have been the Carvin’ Jack by Flexcut. This knife is available in both a right and left handed design, allowing you to choose according to your preference of working toward or away from yourself. It has six specialized tools that cover the basics and allows you to accomplish most any carving task while on the go or when you just don’t feel like messing around with other tools. Plus, it also comes with a great looking belt sheath and leather strop to help you maintain that razor sharp edge so you’re always ready to tackle a new whittling project. See price and reviews of our Top Pick, the Carvin' Jack... Click here. A Beginner’s Guide to Whittling, Art of Manliness. Benefits of Stainless Steel, Assda.